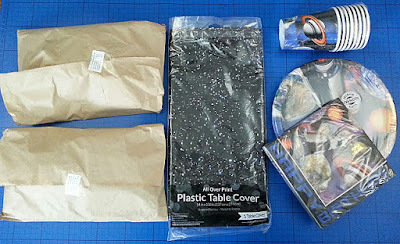 The Brick Castle: Space Blast - Themed Party Packs Review. We have a young man here who will soon be 7, so it was very handy when I was given the opportunity to work again with Party Bags And Supplies. 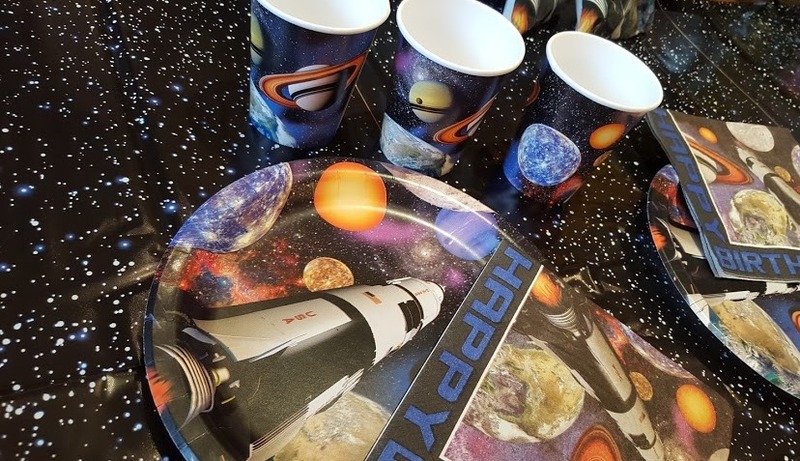 They do exactly as you'd expect, and save you the job of going to multiple places to find your themed party bag fillings and tableware. We are reviewing a Themed Party Pack. 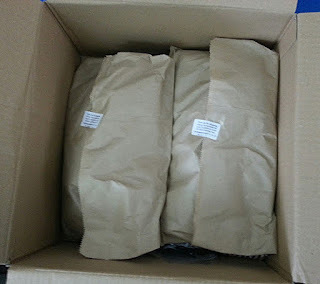 When it arrives your parcel is really neatly wrapped, with 4 party bags in each brown bag, and tableware below. Even though Party Bags And Supplies have an immense range of TV and movie themed products ranging from Frozen, Transformers or Jurassic World to Angry Birds, Barbie and Peppa Pig, my son went for one of the non-franchised themes - he chose 'Space Blast'. 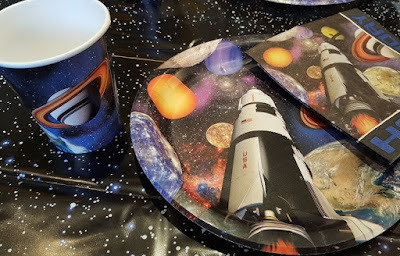 The Space Blast Party Pack for 8 includes all of the basic tableware - 8 plates, 8 cups and 16 napkins, as well as a really generous 54" x 108" (137cm x 274cm) table cover. Everything is good quality and the table cover is actually gorgeous. The plates are labelled 'Premium Strength' and I agree. 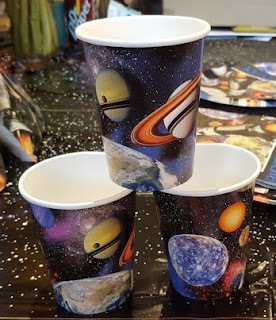 Cups and plates are not flimsy and the napkins are 3 ply. Certainly I wouldn't be disappointed with these at all, and they'll stand up to a plate of jelly and ice cream or an overzealous buffet-goer no problem. The designs are really well done, the colours are vibrant and the images sharp. I think my son chose very well - I'm pleased he didn't just choose his favourite movie character. We have previously reviewed the Minions Party Pack for Party Bags And Supplies, and it's lovely to see that the non-licensed products are as carefully considered. 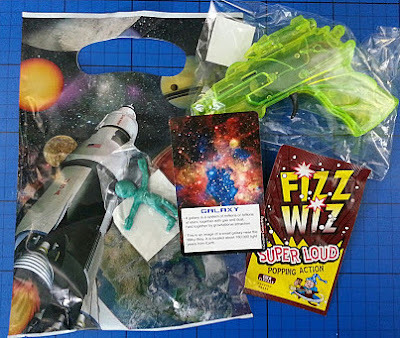 The party bags for the Space Blast Party Pack are really well thought out. I was impressed with the quality of the space blaster guns, and the bags themselves are really nice. The inclusion of a space fact card is a nice touch, and in the 8 bags we had a good selection of different cards. 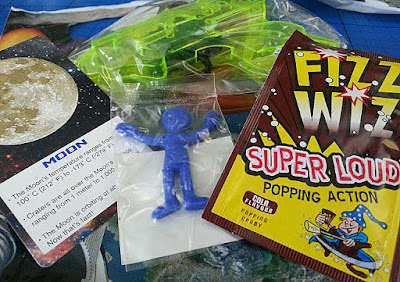 Popping Candy is your perfect astronaut sweet, and as the other item is a stretchy alien (always popular), there is only the one sweet in the bag. I think that's a really good thing. I don't have an issue with children eating sweets as a treat, but I know with party bags it is a bit of a lazy option, and sometimes children end up with a ton of sweets that are gone in 5 minutes with nothing to show for it but a tummy ache. I've been guilty of it myself, but after 20odd years of kids parties I know it can be better than that, and in this case it definitely is. The Space Blast Themed Party Pack for 8 costs £28.20, which is £3.53 per child. I think this is very fair value for the quality of product and time saved. The range at Party Bags And Supplies is incredibly large, so everyone will be able to find something to suit their child, and the thought that has gone in to the party bags really shows. This space party set looks great, I think it's a good theme that never seems to date. I love that everything comes for you ready for you to just set up the party including the goody bags, saves so much time and messing around! Looks like a great party pack! Makes it so much easier when everything is packed for a party. You just need to put it out. It is definitely easy to go overboard - I know in the past I've totted mine up and only then realised I'd spent nearly a fiver a bag! !